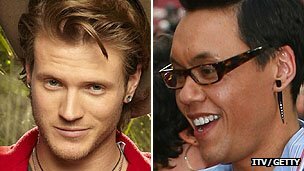 Ear Stretching is very fashionable at the moment with celebs like McFly's Dougie Pointer showing off his stretched lobes in the Jungle and Gok Wan wearing wooden ear tapers. Ear Stretching Problems like infections, blow outs or tears can be caused by stretching too quickly. Also there is a point of no return, where the stretched ear lobe will not go back to normal and may require expensive surgery to repair. To get the look of a stretched ear lobe without the pain or long term implications, fake ear plugs and fake ear tapers or expanders are an alternative solution. Available in Acrylic, Steel, Black PVD there are lots of different designs to choose from. Our Fake Ear Stretching Jewellery has a 1.2mm (16g) shaft so it will fit most standard ear piercings without the need to stretch your piercing, they look really realistic and are great for nights out or to fool your family and friends. We have just added some new designs which include a black dice taper, acrylic stars fake plugs, screw effect fake expander, acrylic star stretchers and acrylic skull tapers.